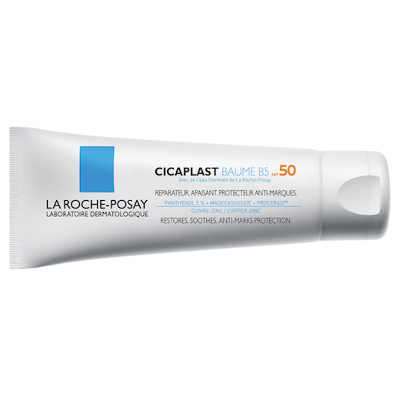 La Roche Posay Cicaplast Soothing Balm SPF50 using a double action formula to soothe and protect sensitive, irritated skin exposed to UV rays. Suitable for adults, children and babies, it can be used on all kinds of everyday skin irritations and minor injuries and is ideal for use on sensitive skin. - Madecassoside - for optimal skin recovery. - Panthenol 5% - soothing comfort, anti-itching. - High protection UVA/UVB SPF50 - helps to prevent red or brown marks and offers tattoo protection. - Procerad™, patented ceramide - helps to repair damaged skin. Not suitable for wounded skin. Avoid lips and the eye contour areas. Aqua / Water, Homosalate, Panthenol, Ethylhexyl Salicylate, Butyl Methoxydibenzoylmethane, Octocrylene, Alcohol Denat., Bis-Ethylhexyloxyphenol Methoxyphenyl Triazine, Styrene/Acrylates Copolymer, Ethylhexyl Triazone, Triethanolamine, Dimethicone, Phenylbenzimidazole Sulfonic Acid, Peg-8 Laurate, Sorbitan Oleate, Zinc Gluconate, Madecassoside, Manganese Gluconate, Isohexadecane, Sodium Acrylates Crosspolymer-2, Silica, 2-Oleamido-1,3-Octadecanediol, Perlite, Drometrizole Trisiloxane, Poloxamer 338, Disodium Edta, Copper Gluconate, Caprylyl Glycol, Polysorbate 80, Acrylamide/Sodium Acryloyldimethyltaurate Copolymer, Acrylates/C10-30 Alkyl Acrylate Crosspolymer, BHT, Tocopherol, Phenoxyethanol.